Toy Story 3 from Pixar. 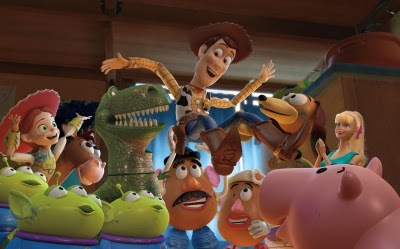 World wide, Toy Story 3 has also become the highest-grossing animated motion picture of all time, taking in more than $920 million at the global box office to date, according to The Walt Disney Studios. They predict that Toy Story 3 will pass the $400 million mark at the domestic box office this weekend, becoming only the second film released by Disney to reach that level. Toy Story 3 currently ranks as the fourth highest-grossing film in company history globally. This is yet another box office accomplishment for the film which took $110.3 million on its opening weekend in June. Finally, Toy Story 3 currently ranks as the number 14 film in worldwide box office history.